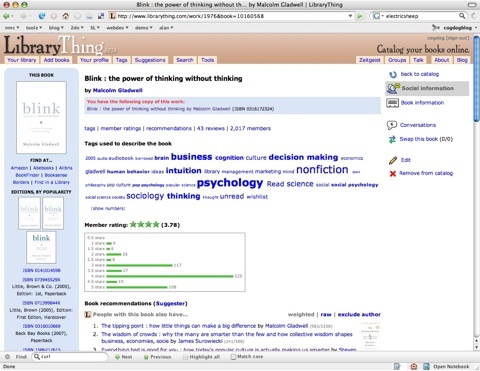 This might be Chapter 57 of my tool brigade— I have known peripherally about LibraryThing for a while, and did play a while ago with a pale cousin named Reader2.. but holy #@^@%, Does LibraryThing (hereto-after referred to as LT) rock as a powerful social net app. I’m working on a subcommittee preparing for university accreditation and trying to think about what’s on and even over the horizon in regard to technology and pedagogy. What do you think I should read? Are there a couple of books or articles or reports that jump into mind that you could share? Like, right now I happen to be looking at Oblinger and Oblinger’s Educating the Net Generation (Educause 2005). Are there recent works like that or even older classics that you’d recommend to help us look into, plan for, and perhaps even facilitate the future of technology-enhanced learning? I’m doing some “break” reading and would appreciate any suggestions. And in come replies with suggestions, maybe 14 messages. But where does this knowledge go that is dumped into the email-o-sphere? It flows past our attention manic eyes on the inbox, and dribbles out the end to oblivion, never really quite useful, retrievable again. We talk of “web 2.0”, this is like Information Management 0.2. 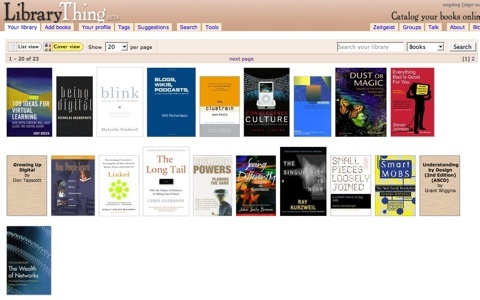 Like any great social web app, there are many subtle layers yet to be discovered, but here briefly is what LT does- it makes it drop dead easy to create your virtual bookshelf, all the books you want to manage, search, tag, share. And via your selections and tags, aggregated across the broader swath of LT users, you get referrals, suggestions, based on the tagging, rating, and collecting habits of thousands of others. But wait, there’s more. First of all, entering a new book is a matter of putting keywords from the title and or the author into a search field. LT uses Amazon as well as almost 80 other catalogs to quickly pull up a series of matches, listed by title and cover icon. You just click the one you want to add to your colllection, and maybe toss on some tags. You get tons of librarian type info on the left, ISBNs, covers, editions, etc. There is a tag cloud based on what others have tagged the same book (more than 2000 people have included this book), and if I follow the tag for intuition, I get links to users that use this tag, books that are most frequently tagged with this, and another tag cloud of related links. And tons more. even better for discovery is a listing of related titles as “Book recommendations” meaning LT defines a relationship based on the tagging habits of those other 2000 users, and presents a long list of related books, so I might end up looking at Flow : the psychology of optimal experience by Mihaly Csikszentmihalyi and with one click I can add this to my collection! This does not necessarily mean I own it, but I may just mark it as a resource. All book entries allow you to rate them on a 1-5 scale and add comments. And there is RSS and linkable syndication all over the place– those are for my most recently added books. But wait, there’s more. I don’t want to be solely responsible for maintaining a collection, where’s the crowd and wisdom? So LT allows me to create a group I can invite others to join, i this case one I called NMC Reading List. If I can persuade those colleagues on the listserv to try this site, they can join this same group, and we end up with a shared pool of resources based on the activities of everyone on this group (and there are discussion areas and RSS and tag clouds and…) For more active groups, check out the ones for Bloggers, Tea Drinkers, Science Fiction Fans, even Colbert Nation book fans. There is much more to LibraryThing, but I am enticed by that sweet spot of providing me a personal organizational/information management gain, and the additive bonus of when this same information can be harnessed across others on the site. And htis takes me back a bit to my Maricopa days, where one of our college’s centers had a web site of book recommendations- they hired students to scan book covers, and manually create HTML pages for a web collection. 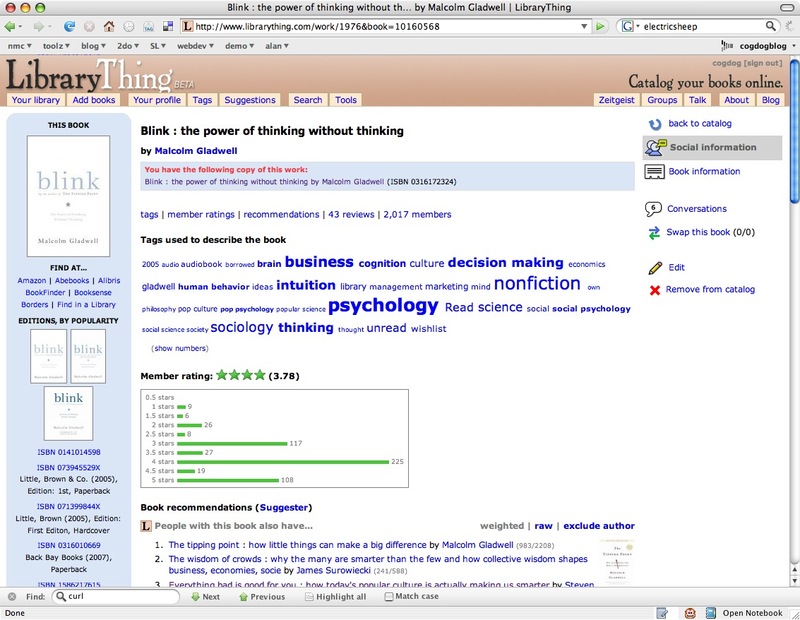 With LibraryThing, it takes much less time and offers much more discoverability paths than the old ways. What a great resource! I’ve put together a group (I think) called Web 2.0 Innovative Thinkers and am asking anyone interested to join and share their collection with others.